Department of Commerce, Indraprastha College for Women organised its annual department fest Bizfiesta’16 on 29th March 2016. 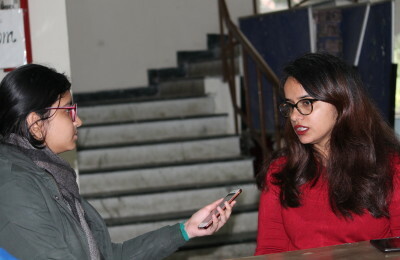 The one-day carnival of competitive events saw participation from different colleges of Delhi University including Lady Shri Ram College, ARSD College, IP University, among others. The fest began with ME vs ME, a bilingual debate competition similar to turncoat debates held in the college auditorium. The topics ranged from “Surrogate advertising is bad” to “Pursuit of money should rule over passion” and “Women deserve reservation.” Vishal R. Singh won the first prize, while Supriya Jain and Nihal bagged second and third positions respectively. The second event lined up was Brambola: Brand Tambola which saw participation of more than 100 students. The event tested one’s knowledge of brands and taglines while at the same time the element of luck played its part. The winners included Vandana, Kirti, Harshita Dang, Chhaya Dabas and Radhika Modi. Next up was the Marvel Marathon, a Marvel cinematic universe quiz with a twist, and the team of Ritvika and Tanya emerged as the ultimate “Marvel Movie Maniac”, followed closely by Shaily and Vidhi. The Ad-Mad competition saw participants putting their creative hats on and enacting jingles and creating slogans for a variety of products and services. The team comprising of Vinayak and MD Anas emerged victorious, while the trio consisting of Harshita Dang, Iti and Jalpa came a close second. After a short break for lunch, the participants picked up more energy and the events resumed with Live Monopoly in the college lawns. Participants tried their hands at being the perfect entrepreneur while playing monopoly. Mohammed Areeb and Chirag bagged the first position, and Ishika and Deepika won the second prize. Other events included Fictional GD and Bollywood quiz. The day very befittingly ended on an enthusiastic note with the Treasure Hunt, which saw teams solving clues and clicking selfies on the quest for the treasure. Shaily Sharma and Garima Bajaj unravelled the treasure chest first, followed by Harshita and Ishika. All the winners of the different events of Bizfiesta were awarded certificates and hampers.